Trying to tell the stories of the Bible on stage is a bold undertaking because it needs to be done in a fresh and creative way. Take over 100 artists, including upwards of 50 actors and 48 playwrights, and give them six hours of your time, and you’ll get one of the most unique retellings of The Bible you could ever imagine. Presented by The Flea, The Mysteries puts a new spin on everything you've ever believed. From start to finish with nearly story in between, The Mysteries is broken up into individual episodes, written by the 48 playwrights, and placed into three acts inspired by medieval mystery plays. Told through various different lenses, The Mysteries literally gives you everything you could want from a night at the theater. Some of the highlight episodes included “Transfiguration” by Billy Porter and Kirsten Greenidge, “The Next Supper” by Lloyd Suh, and “Pentecost” by Sean Graney. Additionally, one of the grandest song and dance moments that got everyone smiling came from the band The Killers as the ensemble accompanied themselves to the perfectly positioned and integrated “All These Things That I’ve Done.” Director Ed Sylvanus Iskandar, along with dramaturg Jill Rafson, curated a nearly cohesive through-line to tell the tale. Though there were the occasional plays that were jarring, including “The Shepherds” by Kimber Lee and “The Conspiracy” by Yussef El Guindi, overall the transition from world to world was effortless. Because these are characters of great note, the arcs came naturally even with the tag team writing. The ensemble of 54 actors, comprised of the Flea’s resident acting company The Bats, many of whom spend a good portion of their evening on stage, did a tremendous job of sharing the six-hour event. There were some incredible performances throughout the ensemble. If there were an award for perfect casting it would go to Colin Waitt as Jesus. Waitt's passion and life was highlighted by his naturally enormous heart. You can't help but fall in love with him. The scripted villains weren't always the hated in The Mysteries, specifically in regards to Lucifer and Judas. Asia Kate Dillon's take on Lucifer was fresh, dominating her moments on stage. Her portrayal of Lucifer as the occasional voice of reason, allowed her to bring incredible depth to the infamous fallen angel. If you had empathy for Dillon's Lucifer, it wasn't accidental. 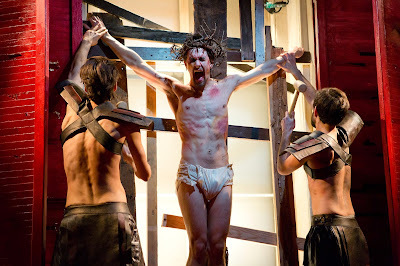 Peter Sansbury is fascinating as Judas. As one of the strongest performers on stage, Sansbury takes the betrayer to new heights. Combined with sensational chemistry with Waitt's Jesus, Sansbury's Judas is filled with compassion and love. Deep within the ensemble came brilliance. Though filling in as incidental characters throughout, Kate Thulin shines as one half of a couple that discovers the recently risen Jesus. Her performance brings tears and earns a much-deserved moment of applause. Alex J. Gould, Rory Kulz, and Eliza Simpson offer some of the hilarious comic relief in their various roles while Tyler Gardella and Elijah Trichon bring the dramatics. The Angel Chorus fills the space with their beautiful voices behind the set, even showcasing many in solo moments. This included spotlighting Ned Riseley's perfectly angelic voice. Overall, the well balanced ensemble truly invites you to be a part of their night. Ed Sylvanus Iskandar can do what others can only dream. Iskandar has assembled an incredible group of artists to tell the greatest story through heart and merriment. By creating an event that blurs the lines of actor and audience, you're instantly included in the action and have a deeper connection with the actors and stories on stage. Iskandar breathes life to his youthful company who are more than willing to bare their hearts, souls, and occasional skin. Along with Iskandar on the creative end, music director and composer David Dabbon and choreographer Chase Brock put their personal stamps bringing stunning fluidity to the world. Loren Shaw’s victorious undertaking in the costume world includes everything you could possibly imagine. From period inspired pieces to hip and modern, Shaw incorporates these styles effectively. Jason Sherwood’s blood red set may seem like a lot at first but accompanied with Seth Reiser’s innovative lighting design, the space transformed from scene to scene, keeping everything fresh. When you take on something big, you expect brilliance. Fortunately, this undertaking is brilliant. The Mysteries is a beautifully triumphant event of epic proportions. Even after six hours and a full belly, you won’t want to leave your new friends.